I am half Japanese and half White. I do not speak Japanese and have never been to Japan. However, I grew up in a predominantly White community where I was always differentiated by my Asian background and was always told to define myself as Asian. When I first interacted with an Asian American community later in high school, they categorized me as White because I did not check enough boxes to be “authentically Asian.” In college, I have consistently had a similar experience meeting others who are full Asian, and it would always bother me when people would minimize my Japanese heritage. It would take too long to explain to most people that my mother, who is White, grew up in Japan, and Japanese food and culture was a large part of my life growing up. Or that my grandmother was born in a Japanese internment camp and resisted learning to speak Japanese because of it. I struggled for a long time with having to justify my Asian background to others while also acknowledging that I am half White. At UVA, I met other people who had felt alienated by others telling them that they were not “Black enough” or “Asian enough.” For the first time, I started to think of myself as a mixed person instead of just half Asian. We created the Mixed Race Student Coalition because being mixed race is a unique experience, and there should be a place on Grounds where people can celebrate their racial identity without having to justify it. It is an amazing group because even though we all come from different backgrounds, we share a lot of common experiences by being mixed. This experience has taught me that your identity is a reflection of how you view yourself, and it is important to not let the opinions of others define it. This post is a part of a collaboration installment between IfYoureReadingThis.org and The Mixed Race Student Coalition. Our two organizations share the a goal of of helping students feel supported in who they are, and and we encourage you to explore their organization. 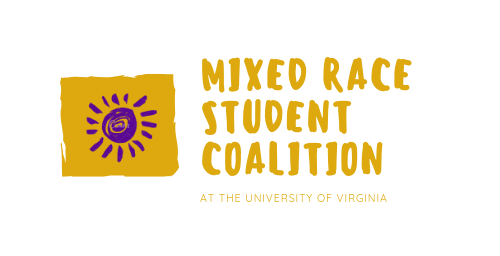 The Mixed Race Student Coalition serves to increase awareness and appreciation of the culture of people of mixed race and/or ethnicity. The Coalition aims to provide a supportive, academic, social, and understanding community for our members and to advocate on political and demographic issues. MRSC also provides a space for students to be fully themselves - without having to defend different aspects of their identity, which they often feel the need to do in mono-ethnic cultural groups. If you want to learn more about MRSC or want to get involved, feel free to email MRSC_exec@virginia.edu and follow us on Facebook and Instagram.